"I WAS BORN TO MAKE BARRELS, BUT THEY WOULDN'T LET ME"
Go here for more about Frances D. Gage. Go here for more about Frances D. Gage's Address to the American Equal Rights Association. 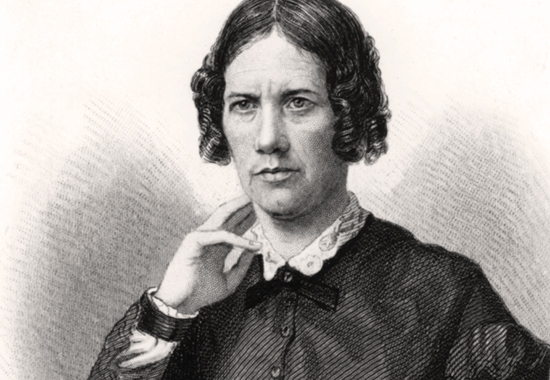 It follows the full text transcript of Frances D. Gage's Address to the AERA, delivered at the first anniversary of the American Equal Rights Association, held at the Church of the Puritans, New York - May 9 and 10, 1867. Transcript according to H.M. Parkhurst's phonographic report - Library of Congress. I have but little to say because it is almost 2 o'clock, and hungry and weary people are not good listeners to speeches. I shall confine my remarks therefore to one special point brought up this morning and not fully discussed. "If I am responsible for the deeds done in my body, the same as the white male citizen is, I have a right to all the rights he has to help him through the world." I shall speak for the slave woman at the South. I have always lifted my voice for her when I have spoken at all. I will not give up the slave woman into the hands of man, to do with her as he pleases hereafter. I know the plea that was made to me in South Carolina, and down in the Mississippi valley. They said, "You give us a nominal freedom, but you leave us under the heel of our husbands, who are tyrants almost equal to our masters." The former slave man of the South has learned his lesson of oppression and wrong of his old master; and they think the wife has no right to her earnings. I was often asked, "Why don't the Government pay my wife's earnings to me?" When acting for the Freedman's Aid Society, the orders came to us to compel marriage, or to separate families. I issued the order as I was bound to do, as General Superintendent of the Fourth Division under General Saxton. The men came to me and wanted to be married, because they said if they were married in the church, they could manage the women, and take care of their money, but if they were not married in the church the women took their own wages and did just as they had a mind to. But the women came to me and said, "We don't want to be married in the church, because if we are our our husbands will whip the children and whip us if they want to; they are no better than old masters." The biggest quarrel I had with the colored people down there, was with a plantation man because I would not furnish a nurse for his child. "No, Nero," said I, "I cannot hire a nurse for your child while Nancy works in the cotton field." "But what is we to do? I'se a poor miserable man and can't work half the time, and Nancy is a good strong hand; and we must have a nurse." He went away in utter disgust, and declared to the people outside that I had got the miserablest notion he had ever heard, to spoil a good field hand like his Nancy to nurse her own baby. We were told the other day by Wendell Phillips, upon the Anti-Slavery platform, that it takes people forty years to outgrow an old idea. And he proved to us, if his silver words are good for anything, that it took five years to outgrow old ideas. The slave population of the South is not yet removed a hundred years from the barbarism of Africa, where women have no rights, no privileges, but are trampled under foot in all the savagism of the past. And the slave man has looked on to see his master will everything as he willed, and he has learned the lesson from his master. Mr. Higginson told us that the slave-master never understood the slave. I know that to be the fact. Neither do men understand woman to-day, because she has always been held subservient to him. Now it is proposed to give manhood the suffrage, in all these Southern States, and to leave the poor slave woman bound under the ban of the direct curse of slavery to him who is the father of her children. It is decreed upon all the statute books of slavery that the child shall follow the condition of the mother. That has been the decree from the beginning of this awful slave system; that the whitest woman, the child of a slave mother, whose hair curled down to her waist, and whose blue eyes of beauty were a lure to the Statesman of the South, should be a slave, though the Governor of the State were her father. Are you to leave her there yet, and desecrate marriage, by making it such a bond of slavery that the woman shall say, "I do not want to be married to suffer oppression!" Are you to force prostitution and wrong upon those people by these unjust laws?" Are you to compel wickedness and crime? Are you going to let it stand upon the statute books of the southern States that the only woman free to work for her own child shall be the mother of illegitimate children? That is the consequence of what you are doing to the people who in all time past, since they have lived upon this continent, have been denied the right of sacred marriage; and who must have, as Wendell Phillips tell us, forty years to outgrow the past, or to educate them. That is what I want to teach the womanhood of the country. I did not mean to talk so long, but I assure you I talk in earnest. If I sometimes, by a slip of the tongue, make some little mistake--for I have not been educated in the schools, (a log cabin schoolhouse in the wilderness gave me all I have)--you will excuse me, for I mean no injustice to any one. And if to-night it will not crowd some better woman or man from the platform, I shall be glad to speak to you again. The argument that has been made that women do not want to vote is like that which we had to meet in the early days of the Anti-Slavery enterprise that the slaves did not want to be free. I remember that in one of our earliest Woman's Rights Conventions, in Syracuse, the reply was made to this argument, that woman was not much to be blamed, because the power of the government and of the church, that was vested in man by the laws, made it impossible for woman to rise, just as it was impossible for the slave to rise while the chains were around him, and while the slaveholder's foot was upon his neck. The common and civil law of England made woman a cypher, and blotted out her civil existence upon her marriage. Blackstone, in his commentaries, says that the law made the husband and wife one person, and that person the husband. This being the power of the husband over the wife, as established by law, that despotism followed which must ever be exercised, when power is vested in one over another, be it man or woman, to the great injury of the victim. The law had crushed woman; and the Church, supporting the law, had assumed that the bible forbade women from using her rights. And if she asked to be a religious teacher, the perversion of the words of Paul was presented to keep her back. When she became a wife, the Church stepped in, and asserted the authority of the husband, and made the wife acknowledge her inferiority and promise obedience to him. That extends down to the present time. That is the law of marriage now among the great body of religious professors in the land; and it is well for woman to know it. Until she can be brought to a sense of her natural and inalienable rights, to go forth and defend herself against these chains of society, she will be kept in this low state. The resolution which was offered in Syracuse, as nearly as I remember it, was that as the assertion that the slave did not want his freedom, and would not take it if offered to him, only proved the depth of his degradation, so the assertion that woman had all the rights she wanted only gave evidence how far the influences of the law and customs, and the perverted application of the Scriptures, had encircled and crushed her. This was fifteen or twenty years ago. Times are altered since. In the Temperance reformation, and in the great reformatory movements of our age, woman's powers have been called into action. They are beginning to see that another state of things is possible for them, and they are beginning to demand their rights. Why should this church be granted for such a meeting as this, but for the progress of the cause? Why are so many women present, ready to respond to the most ultra and most radical sentiments here, but that woman has grown, and is able to assume her rights? magistrate; but that the parties themselves, acknowledging the religious obligation of so sacred a union, were sufficient. And in that Society, the parties were at liberty to appoint their own time and place, and to invite such of their friends and neighbors as they wished to be present; then, in acknowledgment of the divine presence, their obligations to each other were announced, entirely reciprocal, with no assumption of authority on the one hand or promise of obedience on the other; but entire reciprocity, and a pledge of fidelity and affection until death should separate them. For two hundred years, the marriages in the Society of Friends thus conducted, have been held as sacred, the union has been as harmonious, and the management of the children as free from complaint, as any other marriages in the community. The Parliament of England, after a time, saw fit to legalize such marriages; and so in our own country do the laws of the several States. In many of the States the laws have been so modified that the wife now stands in a very different position as regards the right of property and other rights, from that which she occupied fifteen or twenty years ago. You see the same advance in the literary world. I remember when Maria Edgeworth and her sister first published their works, that they were afraid to publish their own name, and borrowed the name of their father. So Frances Power Cobbe was not able to write under her own name, and she issued her "Intuitive Morals" without a name; and her father was so much pleased with the work, without knowing it was his daughter's, that it led to an acknowledgement after a while. The objection has been made to me--"Here you assume equality and independence. Now, I feel dependent on my husband for everything." Women in our Society do not feel dependent for anything. There are independent themselves; and in the true relation of marriage the husband and wife will be equal. Let woman be properly educated; let her physically, intellectually and morally be properly developed; and then, in the marriage relation, in spite of law and custom and religious errors, the independence of the husband and wife will be equal. I was delighted with the remarks made in our Anti-Slavery meeting by our friend Durant, that the conscience, and the sense of right in man, was the basis of law. The idea seemed rather new; but it occurred to me that our friend Burleigh told us that, twenty years ago. We were told, too, that when the work of the Anti-Slavery Society should be finished, there would still be work to do. And although Wendell Phillips is sensitive with regard to the introduction of this question upon the Anti-Slavery platform, adhering so strictly to the Constitution of that Society that he does not want anything attached to it of the other great reforms of the day which do not legitimately belong to it, I think we shall find that he will continue to be as able an advocate for woman as he has been, and that he really does not lower our standard in any respect. Will you give us the evidence that the statement that the women of this country do not want the ballot is not true? I should be glad to believe that; but in may experience the worst opposition to the progress of Woman's Right has come from woman herself. The greatest indifference to the cause is to found among women, and not among men. I wish it were not so. I hope I am mistaken. But I believe nine out of every ten of our public speakers will tell you that they find more help, more sympathy from men than from women. I should like to have that question settled, so far as the women present are concerned. Will as many of you as will vote when the right is awarded to you, please to manifest it by rising. Nearly the whole of the ladies present immediately arose. Indeed, the reporter, from the platform, could not see a single lady who retained to seat. I never found a slave in my life, who, removed from the presence of the people about him, would not tell me he wanted liberty--never one. I have been in the slave States for years. I have been in the slave-pens, and upon the plantations, and have stood beside the slave as he worked in the sugar cane and the cotton-field; and I never found one who dared in the presence of white men to say he wanted freedom. When women and young girls are asked if they want to vote, they are almost always in just that situation where they are afraid to speak what they think; and no wonder they so often say they do not want to vote. Mrs. President, it seems to be my fate to come in at the eleventh hour. We have been talking about the right to the ballot. Why do we want it? What does it confer? What will it give us? We closed our argument at three o'clock to-day by a discussion whether the women of this country and the colored men of this country wanted the ballot. I said that it was a libel on the womanhood of this country, to say they do not want it; and I repeat that assertion. Woman may say in public that she does not want it, because it is unpopular and unfashionable for her to want it; but when you tell her what the ballot can do, she will always answer you that she wants it. Why do we want it? Because it is right, and because there are wrongs in the community that can be righted in no other way. After the discussions we have had to-night, I want to turn to a fresh subject. Last evening I attended the meeting of the National Temperance Association at Cooper Institute. A great audience was assembled there, to listen to the arguments against the most gigantic evil that now pervades the American Republic. Men took the position that only a prohibitory law could put an end to the great evil of intemperance. New York has its two hundred millions of invested capital to sell death and destruction to the men of this country who are weak enough to purchase. There are eight thousand licensed liquor establishments in this city, to drag down humanity. It was asserted there by Wendell Phillips that intemperance had its root in our Saxon blood, that demanded a stimulus; and he argued from that standpoint. If intemperance has its root in the Saxon blood, that demands a stimulus, why is it that the womanhood of this nation is not at the grog-shops to-day? Are women not Saxons? It was asserted, both by Mr. Phillips and by President Hopkins, of Union College, that the liquor traffic must be regulated by law. What privilege does the vote give to the "white male citizen" of the United States? Did you ever analyze a voter--hold him up and see what he was? Shall I give you a picture of him? Not as my friend Parker Pillsbury has drawn the picture to-night will I draw it. What is the "white male citizen"--the voter in the Republic of the United States? More than any potentate or any king in all Europe. Louis Napoleon dares not walk the streets of his own city without his bodyguard around him, with their bayonets. The Czar of Russia is afraid for his own life among his people. Kings and potentates are always afraid; but the "free white male citizen" of the United States, with the ballot in his hand, goes where he lists, does what he pleases. He owns himself, his earnings, his genius, his talent, his eloquence, his power, all there is of him. All that God has given him is his, to do with as he pleases, subject to no power but such laws as have an equal bearing upon every other man in like circumstances, and responsible to no power but his own conscience and his God. He builds colleges; he lifts up humanity or he casts it down. He is the lawgiver, the maker, as it were, of the nation. His single vote may turn the destiny of the whole Republic for good or ill. There is no link in the chain of human possibilities that can add one single power to the "white male citizen" of America. But I deny that, as a class, the women of America, black or white, are idle. We are always busy. What have we done? Look over this audience, go out upon your streets, go through the world where you will, and every human soul you meet is the work of woman. She has given it life; she has educated it, whether for good or evil. She it is that must lie at the foundation of your country, because God gave her the holiest mission ever laid upon the heart of a human soul--the mission of the mother. We are told that home is woman's sphere. So it is, and man's sphere, too; for I tell you that that is a poor home which has not in it a man to feel that it is the most sacred place he knows. If duty requires him to go out into the world and flight its battles, who blames him, or puts a ban upon him? Men complain that woman does not love home now, that she is not satisfied with her mission. I answer that this discontent arises out of the one fact, that you have attempted to mould seventeen millions of human souls in one shape, and make them all do one thing. Take away your restrictions, open all doors, leave women at liberty to go where they will. As old Sojourner Truth said twenty years ago, at the first Women's Rights Convention in Ohio, "Leave them where God left them, with their inalienable rights," and they will adjust themselves to their convictions of their duties, their responsibilities, and their powers, and society will find harmony within itself. The caged bird forgets how to build its nest. The wing of the eagle is as strong to soar to the sun as that of her mate, who never says to her, "back, feeble one, to your nest, and there brood in dull inactivity until I give you permission to leave!" But when her duties called her there, who ever found her unfaithful to her trust? The foot of the wild roe is as strong and swift in the race as that of her antlered companion. She goes by his side, she feeds in the same pasture, drinks from the same running brook, but is ever true also to her maternal duties and cares. If we are a nation of imbeciles, if womanhood is weak, it is the laws and customs of society which have made us what we are. If you want health, strength, energy, force, temperance, purity, honesty, deal justly with the mothers of this country; then they will give you nobler and stronger men than haggling politicians, or the grogshop emissaries that buy up the votes of your manhood. It has been charged upon woman that she does nothing well. What have you given us to do well? What freedom have you give us to act independently and earnestly? When I was in San Domingo, I found a little colony of American colored people that went ever there is 1825. They retained their American customs, and especially their little American church, outside of the Catholic, which overspread the whole country. In an obscure room in an old ruin they sung the old hymns, and lived the old life of the United States. I asked how this thing was, and they answered that among those that went over so long ago were a few from Chester County, Penn., who were brought up among the Quakers, and had learned to read. Wherever a mother had learned to read, she had educated all her children so that they could read; but wherever there was a mother that could not read, that family had lapsed off from the old customs of the past. Give us education. When we have a right to vote, there will not be a school-door in the United States shut to woman. When we have the right to vote, I believe that the womanhood that demanded that the dram-bottle should go out of the home, will demand that the dram-bottle shall be put away from among men. She will say, You have no right to take poison, and make my home a discomfort, or destroy the greenbacks, which should be the mutual possession of the household, by lighting your cigar. She will tell the world, under the new regime, that it is not the Saxon blood that demands a stimulant; but in the new morality it will be as wicked for a man to be drunken as for a woman to be drunken-- as disreputable for a man to be licentious as for a woman to be licentious-- as wicked and perverse for a man to go down to the lower depths of iniquity and folly as for a woman. And the great law uttered upon Sinai amid its thunders, will again be remembered, and will apply as much to man as to woman. Now, it is not so. One code of morality governs the voter, another the woman. As the slaveholder enacted laws that made his own vices crimes in the slave, so men enact laws that make their vices crimes in woman. And this is why we want suffrage for woman. I ask the ballot, not because of its individual advantage to myself, but because I know and feel that individual rights, guaranteed to every citizen, must harmonize the world, if there is any power to do it this side of heaven. And so, not quite eighty years old, as old Sojourner said she was, but standing upon the brink of threescore, having looked this question in the face from my girlhood up-- having labored in almost every vocation in life that falls to the lot of womanhood, as a worker on the farm, a worker in the household, a wife, a mother, a seamstress, a cook-- and I tell you, my friends, that I can make better biscuit than I can lectures-- as one who has tried to study what is for the best interest of society, I ask you candidly to survey this subject in all its bearings. Why may we not take our position as human beings enjoying all the privileges which the Creator bestowed, without restriction other than falls upon every other human being in the community? It is not to-day as it was before the war. It is not to-day as it was before woman took her destiny in her hand and went out upon the battle-fields, and into the camp, and endured hunger and cold for the sake of her country. The whole country has been vitalized by this war. What if woman did not carry the bayonet on the battle-field? She carried that which gave more strength and energy. Travelling through Illinois, I saw the women bind the sheaf, bring in the harvest, and plow the fields, that men might fight the battles. When such women come up now and ask for the right of suffrage, who will deny their request? [Mrs. Stanton then addressed the meeting. As her line of argument was a summary of that recently made before the Judiciary Committee of the Legislature, and already published, it need not here be repeated.